Zentral gelegen 3. 4 Meilen von TCU und 4. 4 Meilen von der Innenstadt. Das Hauptschlafzimmer hat ein Doppelbett. Das 2. Schlafzimmer hat ein Ausziehbett mit einem anderen Rollbett. Ich persönlich wählte die Ausstattung w Qualität und Komfort im Auge. Haus hat den Charme eines älteren Hauses mit Holzböden w neu Dekor. Das Haus hat ca. 900sf so ist es geräumiger als eine Garage Wohnung. Das Badezimmer hat eine Fliese, Eitelkeit und Toliet aktualisiert. Die Küche ist mit Kühlschrank, Herd und Mikrowelle ausgestattet, so dass Sie zu Hause kochen, auch wenn Sie nicht wollen, gehen Sie zu den fantastischen Restaurants Ft. Wert zu bieten hat. Neue HVAC und Fenster wurden im Jahr 2016 installiert. Dies ist ein voll möbliertes Privathaus in einer älteren, etablierten und beliebten Nachbarschaft in der Nähe von Ridgmar Mall, TCU, Will Rogers, die Stockyards, der Zoo, botantischen Gärten, I-30 und der Innenstadt Ft. Wert. Sie können bei einem Ranger-Spiel in 30 Minuten sowie Hurricane Harbour sein. Very cozy and clean cottage. Parking is convenient on street in driveway or garage. Beds are comfortable and kitchen is very well stocked. Washer and dryer are a plus for those that need them. TV and wifi worked fine and lockbox entry was also handy. If you are up for a stroll, the neighborhood itself has some beautiful architecture and there is a bakery and coffee shop within a few blocks as well as fast food and upscale restaurants. Terry the owner was easy to work with. 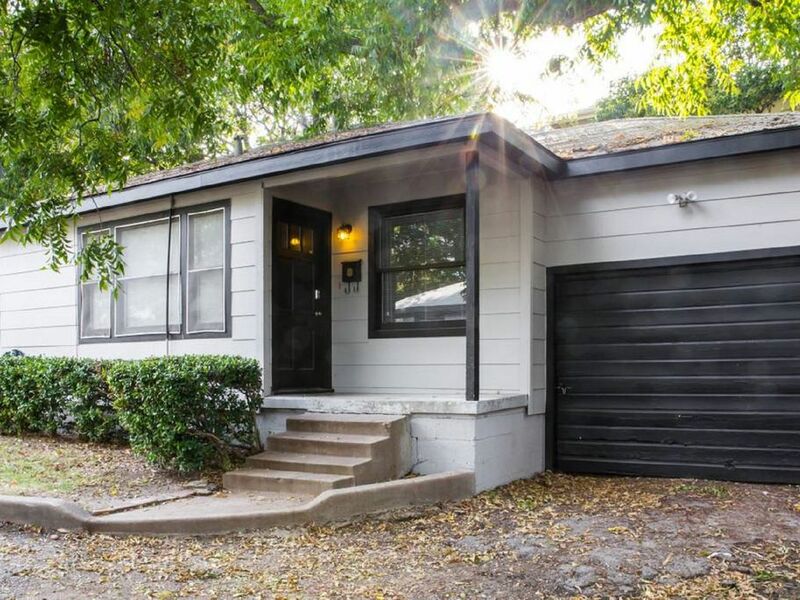 Great location Fort Worth Zoo, Water Gardens, Botanical Gardens and Sundance Square are all within a 10 minute drive. The Fort Worth Stockyards 15 minute drive. Six Flags Over Texas and ATT Stadium, home of the Dallas Cowboys are only a 25 minute drive. If you don't have time for a game make sure you take the tour, this is an amazing structure and a very informative and well executed tour, well worth the time and money. The Bureau of Engraving and Printing and The Texas Motor Speedway are within 1/2 hour, both offering tours as well. Eagle Mountain State Park, 1/2 hour drive north, has spectacular views of Eagle Mountain Lake, and great hiking trails. The only negative, as mentioned in previous reviews, is the living room furniture. It sits very low to the floor and can be difficult to get out of. Overall I would recommend this cozy cottage and would rent again if in the area. We really enjoyed this house and it was the best location for all the activities we had to do all over Fort Worth. It was very clean, very comfortable, and spacious. I slept in the bigger bed and it was extremely comfortable. My friend slept in the twin size bed and said she slept really well also. There was a trundle bed so we could have had a third friend stay and it would’ve been very comfortable. The bathroom was spacious and very clean. We took nice hot showers each morning. We really appreciated the comfy couch for our downtime between baby showers and dinner parties. The Wi-Fi works very well so it was nice to get some work done in the mornings. It was so clean and spotless, I would have never known it was a pet friendly rental. There was no issues with the neighbors being close by, we had lots of privacy and slept like babies. No noise issues. The best part was how we could walk to blue bonnet bakery every morning! We would definitely stay here again when we come back in town! Terry, the owner, is so great and answered all my questions! Thanks. I don't allow pets which is why it didn't smell like a pet friendly rental! Please come again! The house was clean and comfortable. Just what we were looking for at the last minute. Thank you Terry for the use of your house. It was perfect for what we needed at the last minute. The house was clean and comfortable. I appreciate your quick response to our last minute reservation. I stayed at this place toward the end of July and really loved it. Terry was very accommodating, entry was super easy, and the house had everything I needed for my four day stay in Fort Worth. This house is part of a complex of four small units, but I heard no noise from anywhere else and tried to be sure my neighbors had the same experience! The beds are comfortable and you will find every amenity. I was pleasantly surprised because the place is better than the photos. In zentraler Lage 3, 4 Meilen von TCU und 4, 4 Meilen von der Innenstadt, weniger als 3 Meilen von Will Rogers.